Although it is known that Allied airborne forces landed into a German buzzsaw on D-Day, far less is known about the troops they encountered in the dark night of June 6, 1944. 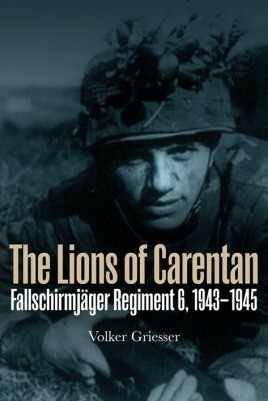 Unfortunately, due to sales rights restrictions, we cannot offer The Lions Of Carentan for sale in your country. Although it is known that Allied airborne forces landed into a German buzzsaw on D-Day, far less is known about the troops they encountered in the dark night of June 6, 1944. One of the formations they encountered was a similarly elite group of paratroopers, who fought on the defensive instead of dropping from the skies, giving their Allied counterparts a tremendous challenge in achieving their objectives. This is the first complete wartime history of the 6th Fallschirmjäger, with numerous firsthand accounts from key members describing the events of 1943-45 vividly and without compromise for the first time. These accounts reveal previously unknown details about important operations in Italy, Russia, on the Normandy Front, Belgium, Holland, the last German Parachute drop in the Ardennes, and the final battle to the end in Germany. With over 220 original photographs, many from private collections and never before published, this book fully illustrates the men, their uniforms, equipment and weapons. Also included is an appendix with maps, battle calendar, staffing plans, a list of field and post-MOB-numbers, and the Knight's Cross recipients of the regiment. Having earned the respect of the Allied forces who fought against them during World War II, this work will inform current readers of the full record of Fallschirmjäger Regiment 6, and why the Allied advance into German-held Europe was so painstaking to achieve. …wonderfully documented book…Within each chapter are numerous detailed and insightful personal accounts of combat, troop movements and war experiences… provides an excellent account of what it was like fighting in WWII from the German soldier's perspective. It was an enjoyable and informative read. The many photographs complimented the text nicely, but were also interesting to view as a photo album. I found this an interesting insight into the combat history of this group of elite troops who earned much respect from their enemies as well for their actions. This is a good insight into the later Fallschirmjager - not as well trained as the original formations but with a fighting spirit that made up for their critical logistic shortcomings. The book is chock full of little titbits, such as squad and platoon composition and the fact that ‘drop' training was only abandoned in early 1944.